Read books in Lao language on your cellphone, tablet, or computer. Big Sister Mouse is our new school on the outskirts of Luang Prabang. Our students range from young children to young adults, and they're eager to practice English with visitors. And at our school, you can help. Do you remember the excitement of rushing home to read a book that you hoped would never end? Of getting so immersed in a game that you forgot everything else, and realized years later that the experience was not only fun, but also helped you develop a well-rounded set of mental, physical, and interpersonal skills? We're Big Brother Mouse, a Lao-based, Lao-owned organization. Since 2006, we've been publishing "books that make literacy fun!" 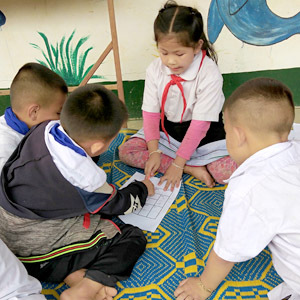 In 2016, we opened Big Sister Mouse, a school on the outskirts of Luang Prabang, with students ranging from pre-school to young adults. There we create a learning environment that is fun and satisfying, while also helping young people develop all their abilities, from reading and math and languages to life skills such as perseverance and cooperation. 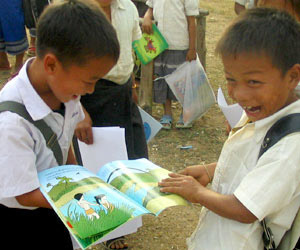 Big Brother Mouse is based in Luang Prabang, Laos; we also have a bookshop in Vientiane. The Story of Big Brother Mouse offers a lively introduction to what we do. We invite you to download this PDF and share with friends: The Story of Big Brother Mouse. Also available in Lao, German, French and Japanese editions; other languages are in preparation.